No one can eat just one, isnt it? 🙂 especially when it comes to melt in your mouth seekh kebabs! Who doesn’t fantasize about having a whole platter of kebabs just to themselves. 🙂 But in case of these Vegan Indian Chickpea Kebabs you can actually do so because they are made of healthy chickpeas and fresh herbs. No animal fat! Infact, if your fantasy included having kebabs for breakfast too..these are perfect protein breakfast kebabs! Being a former meat eater, believe me when I tell you they taste absolutely delicious. While making these kebabs I realised that meat was just a bland medium which carried the flavour..the spices and herbs were actually making the kebabs delicious. So here in this case the chickpeas when nicely blended into a smooth paste and blended well with the spices, taste amazing..and turn into these melt in your mouth delicious kebabs. You can roll them inside some rotis and make nice kebab rolls as well. Make them into small sized nuggets and they can be a perfect mid meal snack for your kids. Make it into a burger patty and have a healthy chickpea burger. Also you don’t really need much oil while shallow frying them. You could bake them as well if you wish too. In this recipe I have also mixed in some dried cranberries that I already had but you could use some raisins if you wish to and serve with any chutney or raita or any sauce that you may like. 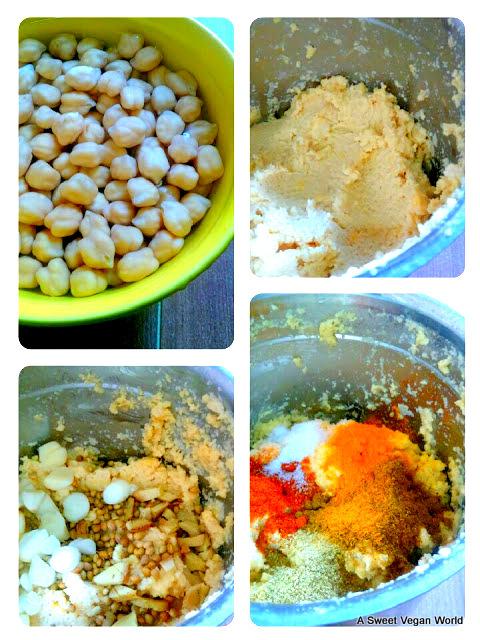 I also find this base chick pea mixture to be very versatile. You can change the spices and turn it into new flavours that you may like. You can turn them into Thai kebabs by adding some lemongrass, galangal, finely chopped kaffir lime leaves and bird eye chillies. You can add a Middle Eastern touch by adding some zatar or sumac spice to this. The variety that you can come up with is truly limitless. 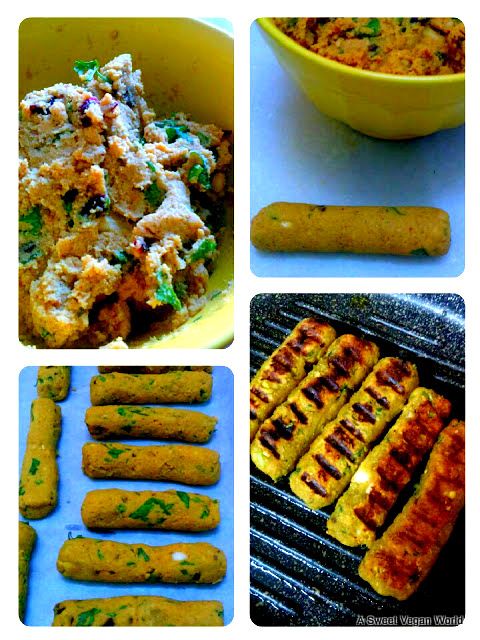 Enjoy and here goes the recipe of Vegan Indian Chickpea Kebabs ..
1. Drain out all the water from the soaked chickpeas. Put them in a blender and make it into a smooth paste. 2. Add in whole coriander seeds, garlic, ginger and blend again. 3. Add in turmeric, red chilly powder, garam masala, chaat masala, salt, sugar and blend for a few seconds more. 4. Now take out the chickpea mixture into a mixing bowl. 5. Add in the dried cranberries or raisins, chopped mint, chopped coriander and mix properly. 6. Take a small ball of the mixture and roll it out on a smooth platform into a small log shaped kebab. 7. Make log shaped kebab out of the whole mixture and keep them in the refrigerator for about 15 minutes. This makes them a bit easier to handle while frying. 8. Take a ridged pan and just baste it with very little oil. Arrange the kebabs on the heated pan and fry them from all sides till properly cooked. 9. Serve with mint chutney, vegan raita, ketchup or any condiment of your choice. Hi Shilpa, this looks totally delicious. I like your refreshing take on veg kababs without any potatoes. The arrangement in the pictures with the matkas is very tempting. Best wishes to you. Will this work with rajma beans? Beautiful pictures and even more beautiful recipe. Bless you. Thanks Priti for noticing the details. 🙂 Mostly my recipes stem from the fact that I don't want to keep feeding potatoes to my kid all the time 🙂 Thanks a ton for your wishes. The ridges on the kebabs have come out so well. Thanks Shruti. Keeping them in the refrigerator for some time helps in handling them on the ridged pan. But they can be made on a normal pan too. The kebabs look so mouthwatering and very simply explained. Pictures too visually speak for themselves.